Couple of definitely shootable bucks, still in velvet, caught on one of friend Scott Morgan’s trail cams. Grandson Cody says he wants to hunt with me this year so it’s probably not too early to start doing a little long range planning. My friend Scott Morgan has several trail cams out and he keeps coming up with photos of big eastern Kansas whitetails. The big guy in the background is probably going to drop his rack any day now. Makes me want to get out there and go shed hunting before the rodents get to them. What’s the old saying? Even a blind hog finds an acorn every once in a while? My long-time fishing buddy and fellow Heart Of America Fly Fishers member Bill Lindley boated this 42.5″ northern pike on a 7 weight fly rod recently. Where? Someplace between Nebraska and Canada. Wish I had been there to slap high fives with him … after he washed his hands of course. Pike are really slimy. The recent OWK conference gave photographer Jon Blumb and I a chance to explore the Flint Hills area near Emporia, KS and catch a LOT of fish. 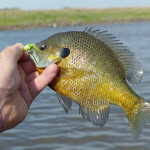 We spent Monday May 4th with guide Bill Hartman fishing a ranch pond for crappie and bluegills from float tubes. Being a terminal geezer and a rooky float tuber I had trouble getting into and out of the tube and I never got the hang of steering with flippers. But once I got seated I found it to be a very comfortable way to fly fish. 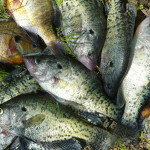 Our supply of crappie filets was down to zero but now, thanks to Hartman, the freezer is full once more. While Bill and Jon filleted the fish I sat in Bill’s truck, mesmerized by the solar powered hula dancer on the dashboard. She obviously has a sustainable power source and leaves a tiny carbon footprint. After cheeseburgers at Jay’s in Emporia Bill took us to Noel Lyons’ amazing antique fishing tackle museum. Among other relics of angling days past was a casting rod made from a Sherman tank antenna. You don’t see THAT every day! 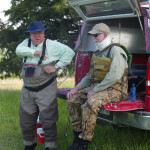 If you want to get off I-35, see more of the Flint Hills, and do some warm water fly fishing Bill Hartman is your man. 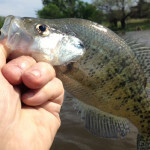 Check him out at http://www.flyfishkansas.com. 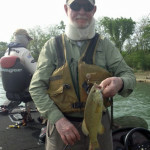 Tuesday we spent four hours on Melvern Lake with Rue Armstrong of the Topeka Bass Club. Between the three of us we boated and released over forty smallmouth bass. The lure of the day was something called a Wacky Worm Rig. I had never heard of it but the funny looking rig quickly made a believer out of me. Some photos courtesy of Jon Blumb. Look what showed up on my trail cam at our farm right after the Missouri fire arms deer season ended. This guy made it through the gauntlet , possibly because he’s totally nocturnal (look at the time signature). But he still had the rest of archery season and maybe black powder season to go. I’m not deer hunting in Missouri right now because I’m turning into an ancient geezer who can’t climb up into and out of a tree stand and because MODOC wants to charge me over $200 for a deer tag to hunt on my own land where I pay Missouri taxes. But it’s funny how, if you’re not hunting, you sort of start rooting for the deer. I’m glad this little buck made it through another season but I hope he winds up in somebody’s freezer before he gets old and tough. You’re driving on I-49 in western Missouri and hear a loud noise that rattles the windows in Butler and Rich Hill, sends wild animals scurrying west across the highway in panic and causes your vehicle to shudder uncontrollably don’t be alarmed. It’s just me patterning my new shot gun before the upcoming spring turkey season. One of my favorite deer hunters Scott Morgan bagged a nice buck recently in Ness County, KS. I’ll let Scott tell it. Project Healing Waters Fly Fishing began in 2005 serving wounded military personnel at Walter Reed Army Medical Center who were returning from combat in Iraq and Afghanistan. Since then it has expanded nationwide, establishing its highly successful program in Dept. of Defense hospitals, Warrior Transition Units, and Veterans Affairs Medical Centers and clinics across the country. The PHWFF program provides basic fly fishing, casting, fly tying and rod building classes to participants ranging from beginners to those with prior fly fishing and tying experience who are adapting their skills to their new abilities. Where do I fit in to all this? 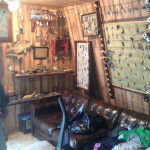 I teach fly tying to -and am sometimes taught by – a small group of vets on Monday nights. Last Monday we had requests for tying instructions on a traditional trout fly, the gold ribbed hare’s ear nymph. I chose a relatively large hook (#12 3X long) because a big hook is easier for beginners to learn on– and because I could see it better. This fly can be tied weighted or unweighted, in many colors, with or without a bead. It looks exactly like nothing but suggests everything from a mayfly nymph to a scud or sow bug. It gets its name from the original body material: the short fur on the ears of rabbits. They still sell real rabbit ears in fly shops for the purists but I prefer packaged dubbing material. Stroll down the aisles of any tackle shop today and look at the shelves. Where are the Heddon Crazy Crawlers and Lazy Ikes of our youth? What has happened to the Fred Arbogast Hawaiian Wigglers, the Bass-O-Renos? They’ve all been replaced by thirty-seven feet of shelf space devoted to … you guessed it… PLASTIC WORMS! We hear a lot about global warming but an even more disastrous fate awaits mankind if we don’t quell the proliferation of those squiggly, wiggly plastic imposters. Mark my words, they’re taking over. Today, a small lake near you. Tomorrow, the world. 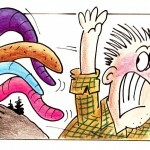 Yes, the number one threat facing mankind today is not climate change, not income inequality, not poverty or lack of health insurance, it’s….GLOBAL WORMING!